March and April are the most exhilarating times of the gardening season. The sunshine is at last warm enough to allow gardeners to comfortably clean out the remains of last year’s beauty. Bulbs’ green tips change into brilliant blossoms. These colors add welcomed contrast to the various greens emerging slowly in the brown soil and to the bare branches of shrubs. Then redbuds, azaleas and dogwoods burst into bloom. These sights awaken from dormancy my new plans for more ornamental borders, vegetables and herbs. From reading Organic Gardening (DK Publishing), I gained clearer concepts of how to accomplish my goals with more natural, less chemical methods. 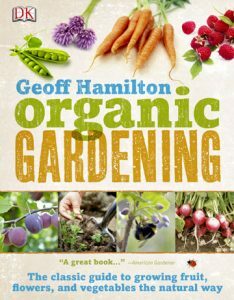 The author, Geoff Hamilton, was one of the early advocates of organic gardening. His many books, articles and BBC television shows from the 1970’s to his death in 1996 all advocated using natural elements to grow great gardens. This 2011 edition of Organic Gardening has been renewed and re-edited by his son, Nick, who is a gardener and a writer. The book’s opening chapters explain necessary topics for any type of gardening such as soil types, soil improvement, fertilizers, pest control, garden planning, etc. with organic stipulations. Sections follow on various types of gardens, such as ornamental, vegetable, container, orchards, and greenhouse. As in all DK Publishing books, excellent photographs accompany and clarify the information and instructions given to a reader. Since my small garden is primarily limited to floral plants, the most informative part of the book to me was its emphasis on improving soil and on choosing ornamental vegetation. Enriching the various soil types, which includes the clay that dominates the Triangle, is explained in organic terms. The plants that do best in various kinds of soils are listed in a section entitled, “Choosing Suitable Plants.” The recommendations for plants that bloom during the beginning, middle and late parts of the seasons include their required PH soil level.